What ever happened to The Man Makeover? Believe it or not, it's still going on! Obviously we haven't been taking photos, but I am still picking out Hub's clothes Monday- Friday. You may remember that my chief complaint with his old wardrobe was that it was mostly band t-shirts and shapeless jeans. I started by introducing lots of pearl snap shirts, some button downs, a few cardigans, and better cut jeans. I did not completely do away with t-shirts, though, as I think there are a lot of good t-shirt options out there so long as the fit is nice and the print is fun. For years, one of Hub's favorite resources for t-shirts has been Threadless. In fact, for Valentines Day a few years ago, I even enrolled him in the t-shirt of the month club for one year, and to this day he still wears most of these on the weekends. So you can imagine how delighted I was when I recently learned that Threadless had launched a "select" line. The prints from the Threadless Select Line are designed by the community (just like the regular Threadless tees) but are curated by Threadless. The products are printed with water-based inks on finer cotton, so they're softer and eco-friendlier. Instead of just the basic, boxy tee shape, the women's collection includes racerback tanks, tunics, and slimmer cut shirts. Men get more t-shirts, but with slimmer cuts and different materials than original Threadless tees. We like them! I wish you could feel the screen to see how soft they are! 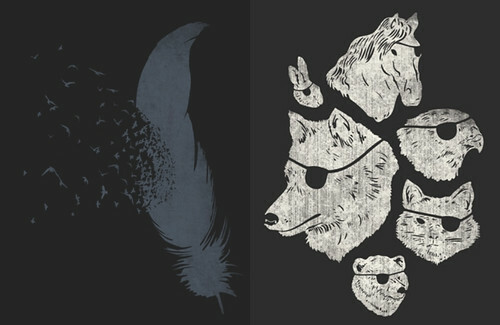 graphics from Birds of a Feather and Animals with Eyepatches! Yes! tunic: courtesy of Threadless Select, jeans: loaner from my friend Joanie, flats: Target. 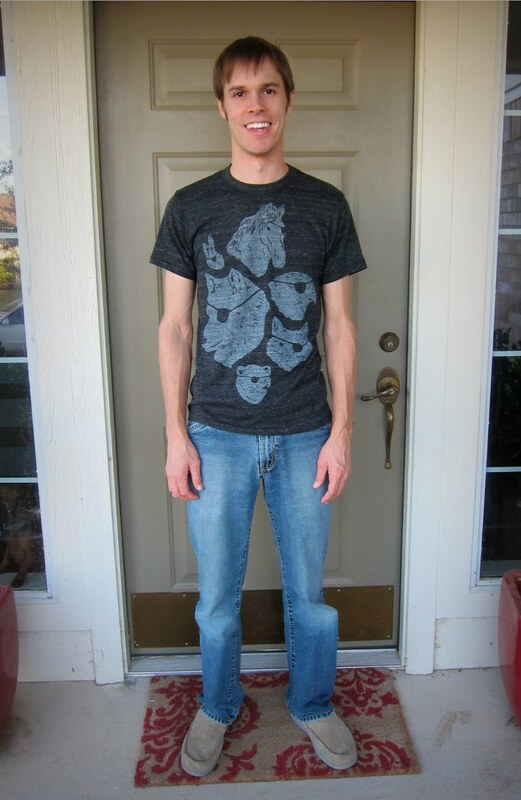 tee: courtesy of Threadless Select, jeans: Replay via Buffalo Exchange, shoes: Crocs. We do plan to retool and relaunch The Man Makeover soon. For 2011 it will evolve from a self-style site to a lifestyle blog. The makeover posts will cover clothes as well as skin care (Hubs will begin a stint as a new video blogger for the men's line at Clinique.com!). It will also cover non-superficial things and tutorials and articles for dudes. Hubs is very funny (he has a killer dry wit!) so female readers will get a kick out of it, too. I'll be sure to let y'all know when we relaunch!